This chapter provides an overall introduction to the book by highlighting the main research problematic of Japan’s normalization and rejuvenation against the backdrop of security challenges faced by Japan today. The chapter first provides a conceptual survey of the literature on Japanese foreign policy, highlights the political paradoxes and dilemmas that Japan has faced through the decades since the end of the Pacific War, and demonstrates that even though circumstances and the environment have changed over the years, the fundamental security challenges that Japan face as a nation remain relatively constant. The chapter presents a theoretical discussion of the ideas behind Japan’s “normalization” and “rejuvenation,” and concludes by laying out the theoretical argument put forth by the book and providing a chapter overview of the book. My core vision for a future Japan is a “beautiful country” that is open to the world, and ready to face the challenges that come our way. Under my guidance, Japan will continue to advance a program of reforms and initiatives to achieve this vision. Do not fall into a brain-dead state of not daring to even lay a finger on the constitution or even avoid debating it. We will create with our own hands a constitution appropriate for the times. In the aftermath of the 2018 June 12 summit between the US and North Korea, held in Singapore, there was vehement disagreement among experts and commentators over the question as to whether anything substantive had been established by President Trump and Chairman Kim Jong-un, or whether it was China, North Korea or the US that had emerged as a winner. The only consensus between various experts is that for the most part, Japan was the country that stood to lose most from this summit. However, this was not due to a lack of trying on Japan’s part. On June 5, 2018, just five days before the Singapore summit, Prime Minister Abe flew to Washington D.C. to meet President Trump. The purpose was to lobby his purported new friend and buddy, whom the prime minister had meticulously courted—even before Mr. Trump was sworn in as president—on the importance of the North Korean issue to Japan’s national interests. The reaction of President Trump, in response to the overtures from the North Koreans to meet, is reminiscent of the Nixon shocks Japan suffered in 1972. This episode also raises questions for Prime Minister Abe’s strategy and political instincts, as like his Liberal Democratic Party (LDP) predecessors (think Nakasone–Reagan or Koizumi–Bush), he strove to build good personal relations with his US counterpart. As the first prime minister of the G7 to personally call President-Elect Trump in New York, the prime minister ignored public and peer opinion in both Japan and the US, probably because he felt this gesture would ingratiate him as a true friend to the new US president and advance Japanese national interests. This strategy seemed to work out well, as President Trump has on various occasions called the prime minister his “good friend,” and reaffirmed the US-Japan alliance in a way that provided much support for the prime minister’s political agenda of normalizing Japan. Even though the optics and language changed, many analysts felt that the US-Japan alliance would climb to new heights under the new president. In other words, Prime Minister Abe had become the “Trump whisperer,” one of the rare few leaders to have a personal rapport with the US president, or so it seemed. This rapport unfortunately did not translate into much influence on an issue of critical importance to Japan and the premier himself. Prime Minister Abe had burnished his political credentials and made his early career advocating for a tougher line against North Korea, for its abduction of Japanese nationals and present nuclear belligerence. This position had not changed since he was deputy chief and chief cabinet secretary (akin to the US chief of staff) to Prime Minister Junichiro Koizumi in the early 2000s. The North Koreans have of course taken a hardline position against Prime Minister Abe. Yet, in characteristic Trumpian manner, the US president swiftly dealt three successive political blows to the Japanese prime minister in a short span of time. On March 8, 2018, President Trump agreed to meet North Korea’s Chairman Kim via a request conveyed by the South Korean national security advisor to President Moon at the White House, by-passing any discussions with Japan—in theory their principal ally in the Asia-Pacific region (Landler 2018). On March 23, 2018, Japan was not exempted by the Trump administration from stiff tariffs on steel and aluminum imports, with one report gleefully announcing “for Japan, the hits keeps on coming.” (New York Times, March 23, 2018). Brazil, Mexico, Australia and South Korea (the last two being allies in the region) were left off the list. Barely three weeks later, the US president gave his “good friend,” the Japanese premier, a rather unpleasant surprise when he told him, on his visit to Mar-a-Lago, that Secretary of State Pompeo had met with Kim Jong-un over the Easter weekend in Pyongyang. He reiterated this again to the White House press corps with the Japanese premier standing by his side, and in his characteristic fashion tweeted about this on April 18, 2018. Prime Minister Abe’s June 5 visit certainly did not secure what he needed from President Trump—namely an assurance that the US would not cut a deal with North Korea until a united position with regards to North Korea could be worked out. This saga of dealing with North Korea attracted much attention and commentary. Even though domestic opinion was relatively muted in Japan, critics of Prime Minister Abe had a field day and derided him on his choice of strategy (or lack thereof) and the ineffectiveness of his personal diplomacy. Others ridiculed President Trump, suggesting that he was as mad as the North Korean leader, unschooled in diplomacy and international politics. The most important questions, however, have little to do with President Trump’s alleged recklessness and/or negligence, nor with Abe’s effectiveness. The escalating North Korean nuclear threat, from the waning years of the Obama administration to the present, represents one of the gravest periods in Japanese security since the Second World War. It raises certain questions about the basic long-held assumptions that Japan’s policymakers and its people have cherished since the US-Japan security alliance was promulgated in 1951. The recent developments detailed above raise more questions than answers for those looking to “normalize” Japanese foreign policy. The North Korea related events of 2017–2018 shocked many Japanese nationals. The world watched in awe as the combative rhetoric between the US and North Korea escalated between President Trump and Chairman Kim, fanning fears of an imminent war between the two nations. Situated at the frontlines of the US alliance network, and as host of US forces in Asia, Japan would definitely be targeted if hostilities were to break out between North Korea and the US. The escalation and war of words did not involve the Japanese leaders in a major way, but the US-Japan alliance could chain-gang Japan into a conflict that Japan was not prepared to fight. In initiating contact with North Korea and agreeing to meet its leader, the US exercised an autonomy within its rights as a sovereign nation, but from the perspective of Tokyo, two offensive elements stand out. First, the US had not given the proper consideration and reciprocity to Tokyo interests on this sensitive issue. Japan’s primary concern was that the US might strike a deal with North Korea to decommission North Korea’s long-range missiles only, leaving Japan well within the sights of its short- and medium-range missiles, even if North Korea stopped her missile and nuclear tests. Second, by arranging the summit without prior consultation with Japan, the US had taken steps to deviate from a united front on an issue that was critical to Japanese interests. This might be construed as a case of “abandonment,” as Japan finds out after the fact, and certainly conveyed a particular message to Japan policymakers that the alliance might privilege American security and interests over Japan’s. The North Korea episodes raise broader and more important questions for Japanese foreign policy in general and for the US-Japan alliance in particular. First, it would appear that Japan as a significant economic power in the region is exasperated and helpless against a belligerent North Korea (USD 28.5 billion GDP in 2016—a fraction of Japan’s USD 4.939 trillion GDP in the same year). Even with the militarization program and Japan’s tightening of the alliance, Tokyo has little political or economic sway against Pyongyang’s missile or nuclear threats. Second, it raises questions about the autonomy of Japan when its political elites bet Japan’s security entirely on the US, particularly on a leader that both the US and Japanese public have little confidence in. This begs the question: are the solutions to US security problems necessarily suited to Japan all the time; and in the same light, can Japan reasonably expect that their interests would necessarily coincide with Washington’s most, if not all of the time? This leads to a further question: how has the development in Japanese foreign policy over the last two decades since the mid-1990s helped or hindered Japan’s security? Such developments do not take place in a vacuum. From the perspective of planners in Tokyo, Japan’s external environment has deteriorated rapidly and correspondingly, these changes have stoked changes in domestic political narratives and processes to adapt to these new challenges. Since the late 1990s, the neo-conservatives have seen their political fortunes rise, and their political agenda has come to define the mainstream political narratives. There are three key ideas behind neo-conservatism. The first idea is that Japan should bring to the fore of public discussions and consideration previously tabooed topics on security, particularly on how Japan could do more in order to fend for itself and also contribute to global concerns (Shinyo 1994; Nakanishi 2003; Ishizu 2006; Morimoto 2008). With the rise of China, much of this national conversation involves discussion on how to handle the “China threat,” and related to this, the balance that needs to be struck between a strategy of an autonomous Japan and changes needed in the US-Japan alliance. The second key strand of conversation relates to the first. In their discussions about Japanese security, neo-conservatives in Japan perceive a key need to explain the necessity for having a national conversation on security in order to drag Japan out of a state of “peace senility or idiocy” (平和ボケ). Pacifism, a key institution of postwar Japan, needs to therefore contend with strands of new thinking that the neo-conservatives regard as necessary for the younger generation in Japan. The neo-conservatives perceive the need for the Japanese people to reconsider how war history in its current form has created a stranglehold on the ability of the younger generation to take pride in their own country, and presents essentially a “victor’s view” of justice, thereby taking away the necessary nationalistic gel for Japan to unite in the face of the precarious challenges ahead. Pacifism also allegedly provides an opportunity for Japan’s neighbors to hold the moral high ground in their bilateral encounters, allowing history to be used in an instrumental manner to gain the upper hand in political negotiations, extract economic concessions or claim cultural and social superiority. The neo-conservatives therefore deem this a weakness, and that Japan needs to undertake normalization to rid itself of the abnormal status that it inherited as a legacy of the Second World War, and strive for a strategic-political status that is commensurate with its economic status (Singh 2002; Hughes 2009; Abe 2006; Aso 2007; Maslow 2015; Katada 2016). As the third largest economy in the world, Japan’s quest for a political status that matches the influence of its economy suggests that normalization is essentially a rejuvenation that would restore Japan as one of the great powers in the world. The third important element is the formal manifestation of the previous two elements in legal terms. Should the Japanese people codify changes in their thinking about security and Japan’s world role, as well as their changing attitude toward the US-Japan security treaty, by making revisions to Japan’s postwar peace constitution? Should Article 9 of the constitution be amended or revised to accommodate the necessary changes? An amendment to the peace constitution might be also be a bold identity statement that Japan is to be recognized not only as a “normal” power in all senses of the word, but also politically, and be accorded with an eminent status commensurate with her economic power and global contributions. The processes of normalization and rejuvenation are essentially two sides of the same coin. The author argues that the processes involved are two dimensional—normalization being restorative, while rejuvenation allows Japan to become the nation-state par excellence. The overall process is of an ascendant trajectory, but faces resistance and obstacles both inside and outside of Japan. Despite this, the strategic direction in which Japan under the neo-conservatives is heading is clear, but the road ahead is not without pitfalls and challenges. This book seeks to explain and locate the difficulties that Japan faces in its rejuvenation process by examining the contradictory forces that drive Japan’s foreign policy, and the challenges that lie ahead of the possible trajectories of its rejuvenation. One of the biggest challenges for Japan in its quest for rejuvenation is the prospect of eroding its democratic institutions, and falling into the trap of a hegemonic struggle between China and the US, where Japan faces a lose-lose prospect of either being entrapped in a conflict it has no desire to enter or being sidelined (abandoned) in the case of a grand bargain being struck between China and the US. Rejuvenation should have the overall effect of enhancing Japanese security, reducing the cost of defense and allowing Japan to build a conducive external security environment. Yet, after two decades of neo-conservative maneuvers, Japan is nowhere near establishing a better external security environment, and the costs of its remilitarization have increased. Relations with North Korea and China have grown increasingly tense. In the following section, a general survey of the conceptual literature on Japanese foreign policy is undertaken, before the chapter moves on to discuss the major challenge that Japanese democracy faces vis-à-vis the processes of normalization and rejuvenation. Scholars and policymakers concerned with Japan’s foreign policy have long debated the peculiarities, strengths and weaknesses of Japan’s foreign policy, the study of which has been deeply influenced by developments in international history, international relations, political economy, and development studies. Given Japan’s unique foreign policy position since the end of the Pacific War, it is no surprise that the literature on Japanese politics and foreign policy has taken on a unique characteristic too. The first generation of literature mostly focused on the historical sources and the institutional structure that emerged in postwar Japan and its relation to Japanese politics and foreign policy. Scholars have written numerous volumes on how the Pacific War and its aftermath have influenced the making of contemporary Japan (Dower 1986, 1999; Barnhart 1987; Beasley 1987; Crowley 1966; Morley 1983; Nish 1966, 1972). Most of the literature outlined Japan’s perceptions of and aspirations and expectations for their relations with China (Iriye 1982, 1999), Britain (Nish 1966, 1972) and the US (Morley 1983), illuminating how these relations were critical in driving imperial policies prior to the war. The influence of the US became all the more dominant in the postwar period as Japan’s foreign policy was dictated (Agawa 1998) and influenced by the US (Schaller 1985; Dower 1979; Auer 1973; Weinstein 1971) as the Cold War set in. As Japan’s economy rises, the importance of cultural factors in explaining why and how Japan’s policymaking began to help is important. In particular, the importance of nihonjinron (日本人論) and how this uniqueness tended to underlie much of Japan’s success (or not) (Befu 2001; Katzenstein 1996, 1998; Davis and Ikeno 2002; Dale 2011). Other than the uniqueness of Japanese culture, much of the scholarly focus has been on the party and the state in Japan as the principal drivers of policy. Johnson (1982) has written on the importance of understanding how Japanese bureaucracy operates, in particular how the Ministry of International Trade and Industry (MITI) and the state have taken on a special dimension in planning Japanese economic activity and are instrumental in its success (Johnson 1982, 2001). Japan’s political and economic model has therefore become the focal point of many scholars’ efforts to understand and explain what lessons could be drawn it. This trend continued with Ezra Vogel’s Japan as Number One: Lessons for America. This book was one of the bestselling English books in Japan since its publication in 1979, only to be followed about a decade later by Ishihara Shintaro’s The Japan that can say No, another bestseller in Japan. Both books analyzed aspects of Japan’s phenomenal success. The former discussed the strengths of the Japanese model that were instrumental to its rise, and the latter suggested that Tokyo should rethink and re-manage its relations with the US as a result of its newfound strength. The “Japan threat” period in the 1980s was fueled in part by xenophobia, in part by Japan’s ascendant economy, where Japanese corporations were buying up large chunks of real estate in New York and Los Angeles. This naturally was deemed a threat by many US scholars and politicians, particularly when everyone felt that Japan was in fact free-riding on the US for defense. This trend of books advocating the ascendance of Japan took a respite in the 1990s when Japan’s economy fell into deflationary growth. However, this did not deter scholars working in development studies and political economy from trying to expound on Japan’s relations to a new model of capitalism in East Asia. Japan is seen to be the inspiration for a new form of state–society relationship—not only for the greater East Asian “Tiger” economies of South Korea, Hong Kong, Singapore and Taiwan, but also for Southeast Asian economies and China. The “developmental state” model promises to provide an alternative to Western-based liberal capitalism (Woo-Cummings 1999) which could be a formula that countries outside Asia could emulate. There is therefore a widespread interest in the special role of the state and the party-system in Japan, as many perceive the key ingredient of success is the stability experienced by the voters in Japan. There is also much research interest in electoral systems and the dominance of the LDP in Japanese national politics (Curtis 1988, 1999, 2009). Factional politics was weakened by changes in electoral reform to a single-seat system. There are other reasons of course: US interference in the early years, the LDP’s successful strategy of playing on the insecurities of the electorate, and the increasing marginalization of the leftist parties have also been attributed to why Japan’s one dominant party state has lasted such a long time. Toward the late 1980s and 1990s, Japan’s related research blossomed for three reasons. First, Japan has stood out due to its exceptionalism, particularly in terms of the disparity between its economic prowess and its reliance on the US—in short because of its “abnormal” status created after the Second World War. Compared with the US, the term “exceptionalism” when applied to Japan has more of a cultural connotation. Second, by this time there has been considerable evidence for the buildup of empirical examples for theoretical innovation in terms of international relations theory, particularly for Japan’s foreign policy making—in particular in the literature focusing on ideational influences in Japan’s foreign policy. Third, empirical developments in circumstances prompted Japan’s foreign policy community to embark on greater discussions and debates over the question of the “burden of history,” as well as Japan’s relations with its neighbors in Asia. To say the least, the difficulties Japan has had with its neighbors prompted much research on historical issues. This is also accompanied by the emergence of a more assertive Japan, evidenced by increasing friction with its neighbors, notably with China and also with South Korea over a host of “history” related problems (Yoshibumi 1998; Midford 2011; Maslow 2015; Auslin 2016). From the 1980s’ textbook problems to the comfort women issue with the South Koreans, the literature concerning what many scholars would call the “burden of history” blossomed. Buruma’s (1994) The Wages of Guilt: Memories of War in Germany and Japan is probably one of the most recommended texts on Japan’s war guilt alongside Berger’s (2012) War Guilt and World Politics. This growing trend of literature attests to the perceived recalcitrant attitude of Japan over a host of political issues such as the Nanjing Massacre (Chang 1997; Fogel 2000; Igarashi 2000); the issue of apologies and atonement for its wartime transgressions, and its relationship with Japanese national identity (Lind 2008; Dudden 2008; Heine and Selden 2000; Hashimoto 2015); and the question of selective remembering (Dudden 2008; Seraphim 2008; Orr 2001; Gong and Teo 2010). In terms of foreign policy, scholars debate the primary drivers of Japan’s foreign policy from different perspectives in international relations theory. While it is not wrong to say that Japanese diplomats, like their counterparts elsewhere, are hard-nosed neo-realists, the scholarship on Japanese foreign policy is dominated by pieces pertaining to the impact of pacifism in particular, referring to the influence of anti-militaristic norms and how they have been the dominant guiding principles in Japanese identity, politics and foreign policy (Katzenstein 1996, 1998; Berger 1998, 2012). This category of writing fits squarely into the theoretical work done in international relations theory on constructivism in general and other ideational influences, such as techno-nationalism, on Japan’s foreign policy mechanisms (Samuels 1994, 2007). Even though there is discussion on how ideational factors influence Japan’s foreign policy (Berger 1998, 2012; Cha 2000; Katzenstein 1998), structural realism cannot be discounted. Many scholars have argued that ideational matters play an important role in postwar Japan, but this does not negate the fact that the decisions undertaken by postwar prime ministers could be born out of neo-realist considerations rather than anything else. Prime Minister Shigeru Yoshida’s decision to implement the Yoshida Doctrine, where Japan agreed to follow the US lead in foreign and strategic affairs, could be construed as a reasonable neo-realist move as it was the best play Japan had under the postwar circumstances, as he himself noted in his memoirs. To this day, many in Japan regard him as an old school liberal. The end of the Cold War ushered in more research on how various countries responded to the demise of the USSR and correspondingly to the possibility of a US retreat in the face of China’s rise. These systemic changes have proved unsettling for most countries in the region, and held various implications for Japan’s foreign policy. There are a few strands of research here. The US-Japan alliance is one of the fundamental bedrocks of Japanese foreign policy, and in turn Japan is a critical component of the US strategy in Asia (Welfield 1988; LaFeber 1997; Green and Mochizuki 1999; Ikenberry 2003; Dian 2014). Since the end of the Pacific War, even though US-Japan relations have been relatively stable as the Japanese people wholeheartedly embraced all things American (Dower 1979, 1999; McCormack 2007), this set of bilateral relations has had its own fair share of challenges (Crowley 1966; Packard 1966; Dower 1999; Funabashi 1999; Nozaki 2008; Grimes 2008). Obviously, the most important question raised then was whether circumstances had changed so much that it meant the end of the US-Japan alliance (Funabashi 1999; Tsuchiyama 1995; Calder 2010). This would mean a departure from well-established practices of the US-Japan security policy that have underpinned Japanese foreign policy in place since the postwar period (Weinstein 1971; Scalapino 1977; Armitage and Nye 2012). The decision by Japan and the US to tighten the alliance and to ensure that Japan continues to play this exceptional role (Green 2003; Hornung and Mochizuki 2016) meant that for most part, the role of the US in Japan’s foreign policy has become more salient, not less. The fundamental question is therefore how Japan should adjust its foreign policy to the new roles both Tokyo and Washington are playing while going forward, and if the stimulus for changes are endogenous versus exogenous (Hicks 1997; Hook et al. 2011; Samuels 1994, 2007; Santoro and Warden 2015; Green 2003, 2017). The changes in Japan’s external security environment and domestic politics have also led to a sea-change in Japan’s foreign policy with regards to its immediate neighbors China and Korea (Cha 2000; Pempel 2003; Tanaka 2007; Wan 2008; He 2009; Bush 2013; Sohn 2010; Lam and Teo 2011; Rose and Teo 2013; Lee and Teo 2014; Calder and Ye 2010; Chien 2011; Glosserman and Snyder 2015; Rozman 2015), as well as in Japanese relations with the Southeast Asian countries (Graham 2006) and Japan’s role in regionalism (Green and Gill 2009; Sohn 2010; Cioraci 2011; Chung 2013). Inevitably, all this research speaks to the fact that there is an increasing tension between a Japan that wants to institute a more neo-realist, “interest” based policy on one hand, and one that is deeply influenced by pacifist norms. While this might be true, over the last two decades more scholars have become convinced that neo-realism plays an increasing part in Japan’s foreign policy, even though the debate on the extent to which ideological factors still influence Japan’s foreign policy rages on (Lai 2013). There is a slew of literature that attests to this, particularly on the narratives surrounding the security debates on how Japan should act. At the heart of these narratives is the question of “normalization,” and how Japan could or should act to best to define and/or protect its interests in the near future (Singh 2002; Inoguchi 2008; Soeya et al. 2011; Oros 2009, 2017; Welch 2011). Today, Japanese foreign policy appears to be in a state of inquietude and exhibits contradictory tendencies. For most of the Cold War, the struggle between the right wing and the left wing was well documented. We see Japanese politicians debating and arguing about the best way forward to protect Japanese democracy from authoritarian regimes such as China or North Korea, but only to make and enact policies in a relatively anti-democratic manner to further their agenda. One need not look far, as for years Okinawa has complained about the US bases there, and recently young protestors lambasted the Abe administration for attempting to force constitutional reforms upon the Japanese electorate. Even though ordinary Japanese people living in Tokyo and Osaka pride themselves on being peace-loving, forward-looking democrats, they vote in right-wing nationalists such as Shintaro Ishihara (repeatedly) and Toru Hashimoto (as governors of Tokyo and Osaka respectively), whose remarks have often riled Japan’s closest neighbors—China and Korea. The Japanese nation seems to reward nationalists and conservatives with political longevity—with left of center leaders such as Junichiro Koizumi and right of center politicians such as Shinzo Abe having the greatest public support. Even though the Japanese debate on whether they should become more autonomous in their foreign and security policies, the Japanese elites double down on their alliance with the US, thereby becoming more reliant on the US each day. Today, Japanese conservatives (or more accurately neo-conservatives) are more concerned with removing institutions (such as the constitution) put in place after the war rather than conserving them, while those who want to preserve these very institutions are regarded as “leftists” who are afflicted with “peace senility.” Likewise, those who argue that Japan’s interests should be placed above the US where they diverge are characterized as radicals, while those who argue in favor of the US-Japan alliance must be protected at all costs are known as nationalists. The neo-conservatives arguably command the most attention for the way forward strategically for Japan. However, even though Prime Minister Abe does his best to mobilize the country behind his attempts to amend the Japanese constitution, fierce undercurrents move against his normalization and rejuvenation agenda. Domestically, he faces fierce protests from various quarters, particularly from civil society for his constitutional amendment. Even though the polity believes that something has to be done to secure Japan’s future, there is evidence that voters who put the LDP in power did not vote Abe in because they supported the revision of the constitution, but rather because they wished to see a party with experience in power that would safeguard Japan’s prosperity. Externally, the neo-conservatives seemed to have maneuvered Japan into a binary choice situation: either double down with the US or suffer a strategic future dominated by China. In short, Japan’s strategic choices always invariably appear to be presented in a polemic manner. Japan is to choose between pacifism and remilitarization; to elect to bandwagon with the US against China or to become more independent. This book examines the nature of Japan’s attempt at normalization as a nation-state and its rejuvenation as a global power, arguing that these two dimensions are in fact two sides of the same coin—simply Japan is already an exceptional state in the world, given its natural geographic, demographic and strategic attributes. Chapter 2 will present some long-standing Japanese political and philosophical ideas about statecraft, diplomacy and world politics. It will show among other things the tendency of Japan historically to constantly act in partnership with the prevailing global hegemon, and more often than not try and retain a number two ally position with the hegemon. Today, this is still true even when some scholars, such as Ezra Vogel (1979) who argued in his book Japan as Number One, the US has lessons to learn from the Japanese people and that Japan has the potential to become a global power in her own right. The Westphalian notion of the modern nation-state assumes that all states, large or small, have certain attributes which make them similar, regardless of the political system that is instituted in the nation-state. Whether it is a constitutional monarchy, a military junta based regime or a communist regime, a nation-state is expected to have these basic attributes: (1) well defined territory; (2) a population that has similar shared cultural attributes, such as common history and language; (3) an effective central government with a monopoly on the use of force; (4) a functional and viable economy; (5) diplomatic recognition by other nation-states and hence an ability to enter into international treaties and wage war. The idea of “normality” implies that Japan would do what it takes to restore these attributes. In Japan’s case, it is really because of its renunciation of the right to belligerence through Article 9 of the constitution after the Second World War that Japan today is regarded as an abnormality. This war-renouncing clause is both legal and political. It is legal because all decisions with regards to Japan’s strategic and foreign policy, as well as the role of the military, stem from the constitution—technically the highest legal document in any given country. Hence in policies regarding the military—whether it is the decision to deploy the military for whatever purposes, or the status of the military within Japan itself for that matter, or the questions of what Japan can or cannot do within the ambit of the US-Japan alliance—Japan remains constrained by law because there is only so much latitude given to the prime minister for interpretation. It is political because today anti-militarism norms define the Japanese character deeply and Japanese domestic politics regard any changes to this pacifism as an affront to Japanese national identity. The angst is further accentuated given the exigencies of changing geopolitical circumstances—of a rising China, a belligerent North Korea and a US bent on unilateralism. In theory, nation-states are “equal” under the UN Charter. However, in reality, countries possess varying degrees of strategic strength and political identities, and are at different developmental stages. Consequently, each country has their own preferred trading partners, political allies and international affiliations. Each nation-state has some countries that are extremely close or important to them, and some that they just cannot get along with—either out of competing interests or conflicting identity and values. Within the community of states, there will be some that are often therefore premised on realpolitik indicators, military strength, economic strength, ideological appeal and cultural supremacy. Status is something that Japan has craved since the fifteenth century and continues to be one of the most important but understated drivers of Japanese political behavior. It is therefore important to look to history to understand the traditional drivers of Japanese foreign policy today. Japan seeks equality, but at the same time also excellence in its endeavors, and this necessitates the attainment of status in a hierarchical global order. Additionally, apart from the Second World War period, Japan has never sought hegemony in the international system, but instead has always relied upon establishing cordial relations with the hegemon, learning from the hegemon instead. This has always ensured Japan thrives in the existing system, and allowed Japan to develop to its modern-day form as a super developmental state. Japan historically exhibited three important methods of achieving this goal. First, Japan has always leaned toward (some scholars prefer the term “hedged”), or bandwagoned with, the dominant power of the day, keeping cordial relations with the hegemon and benefiting from trading ties, while leveraging this relationship to maintain independence and latitude to act within the political system. In pre-historic times, Japan kept cordial relations with China and adopted technologies such as the writing system, Confucian philosophy, silk making to the operations of the tributary trade system. At the turn of the nineteenth century, Japan joined forces with one of the most powerful and successful colonial powers—Great Britain. First, Japan defeated Russia in the 1905 Russo-Japanese War, and later on during the First World War, balanced against Germany and seized its territories in the Pacific as spoils of the war. The alliance fell apart in 1920 due to racial tensions and realpolitik, as the British were not ready to accept a powerful and rising Japan (Vinson 1962; Nish 1972). By the 1930s, Japan found a new idol and ally in Nazi Germany, perceiving it then to be one of the most powerful countries in the world. The Japanese notion of Pan-Asianism was in fact dominantly inspired by the Germans (Hotta 2007). Japan perceived that the US was the single biggest threat to Imperial Japan’s plans in Asia and conducted a pre-emptive strike on Pearl Harbor. In the aftermath of the Second World War, Japan aligned with the US to balance against the USSR, and in the post-Cold War world, balance against China. Second, Japan has always been able to learn and adopt from both friends and foes in the international system, particularly from the hegemon of the day. From ancient China, then Britain in the early twentieth century, to the US in the postwar era, Japan has always resisted hegemony to maintain its independence and adopted the strengths of the hegemons and improved upon them (Maruyama 1963; Peattie 1975; Shintaro 1991; Samuels 2003). From the tributary system, then imperialism and gunboat diplomacy to the building of a modern capitalist economy, Japan’s ability to adapt to and innovate within the existing system is unparalleled. Some scholars have thus labeled Japan an “adaptive” state (Berger et al. 2007). Third, Japan has always been able to swiftly transform itself politically—from the feudal clans to the centralized Tokugawa Shogunate system to the Meiji State where the Samurais were swiftly disbanded, to Taisho democracy, to ultra-nationalism and the liberal democracy that followed, Japan has never seemed to have problems discarding or adopting institutions. Karel Van Wolferen alludes to the idea that “the most crucial factor determining Japan’s socio-political reality … is the near absence of any idea that there can be truths, rules, principles or morals that always apply, no matter what the circumstances” (Van Wolferen 1989: 9). This might be overstating the character of the Japanese people. The Japanese nation has prized loyalty and excellence as two important attributes that generations of Japanese have striven to achieve, with great success. I would say that Japan’s impressive shape-shifting abilities have more to do with its wholehearted quest in its tasks at hand—nothing more, nothing less. Regardless of theoretical persuasion, there is no question among scholars of Japanese foreign policy that Japan’s role in the international system has changed somewhat over the years. The question of “normalization” is no longer an “if” question or even a “when” question, but rather a question of “how” and “in what form.” At the most basic level, the definition of “normalization” as understood by this book is the socialization of Japan as a power with political status and strategic capabilities that are commensurate with its economic achievements and the acceptance of the international community of the greater role Japan may play in international affairs. To that end, since the late 1970s, Japan has provided overseas development assistance to most of the countries in Southeast Asia and China. Japan has also strengthened multilateral trade agreements with its neighbors, dispatched peacekeepers (Tanaka 2007; Lam 2009) to Cambodia and East Timor, and helped in UN or ASEAN disaster relief efforts, such as in the aftermath of the 2003 tsunami that killed 230,000 in the Indian Ocean rim countries or Typhoon Nargis in Myanmar. Japan has supported peacebuilding diplomacy in Aceh and pushed for greater regional integration through ASEAN institutions. Yet, it is questionable whether these activities could really testify that Japan has “normalized” and even if so, to what extent can we say for sure that this is the case. The Asia-Pacific region has historically been considered to be Japan’s backyard, while these activities do prove that Japan is becoming more assertive politically, they cannot attest to the restoration of political and security status proportionate to Japan’s economic stature. One would naturally assume that most of this literature from the 1990s onwards would be centered on Japan’s “normalization.” Surprisingly, this is not exactly the case. There have actually been very few books written exclusively on this subject matter (Oros 2009; Soeya et al. 2011; Hughes 2006, 2009, 2015), even though admittedly most of the scholarly literature does discuss this in part—whether it be the Japanese role in peacekeeping or Japan’s relations with the US, China or Southeast Asia. What is evident is that when discussing Japan’s normalization/rejuvenation, different politicians and scholars have radically different images of what this entails, even though the areas of discussions overlap. As Welch notes, how a state defines security and what it takes to achieve it are two very different things, and more importantly how a state defines its national interests might change over time, as in the case of Japan (Welch 2011: 17). The former prime minister of Singapore, Lee Kuan Yew, said in the mid-1990s in a commentary that “to let an armed Japan participate in [peacekeeping operations] is like giving a chocolate filled with whiskey to an alcoholic.” Such a view echoes the many discussions and debates that are located within the mainstream international relations theory on liberalism/realism. The dominant narratives put the “nature” of the Japanese nation under scrutiny. These policymakers and scholars (often from the vantage points of Japan’s neighboring countries—China, Korea and Southeast Asia) often debate whether it is an inherent characteristic of Japan to seek power as an end in itself and, if given the latitude and opportunity to do so, whether a resurgent and militaristic Japan would ascend once again in Asia (Austin and Harris 2001: 137). On the flip side, there is a corresponding reaction on the part of many Japanese politicians and scholars who perceive things differently. From their standpoint, the greatest impediment to the “normalization” of Japan stems from the misconceived ideas, discourses and narratives that exist both inside and outside Japan to the effect that Japanese people are “nationalistic” or “militaristic.” It is the failure of these critics to recognize the significance of the nature of the Second World War (that the Japanese people were “misled” rightly or wrongly) and that Japan has since been reformed and is now one of the pillars of regional and global prosperity. These politicians and scholars perceive that in order to achieve normalization, a fundamental shift in mindset and worldview is necessary, and this change in mindset (i.e. eradicating pacifism) should emanate from the Japanese people themselves, especially from the younger generation (Nakasone 1999; Abe 2006; Aso 2007). Beyond that, Japan should use its political-economic and diplomatic influence to ensure that this new image of Japan is propagated worldwide, and in addition engage critics to ensure this erroneous misperception of Japan as a militaristic country not be left to stand. Emanating out of a desire to ensure that international relations theory becomes more “scientifically rigorous” and systematic, scholars working from the neo-realist perspective ground the debate differently from their realist counterparts. Unlike realism, where power is seen as an end in itself, neo-realist scholars often ground their debate on “normalization,” by focusing on the concept of “national interests” in Japan’s conceptualization of its foreign policy and on Japan’s defense and security capabilities (or lack thereof). Invariably, these discussions on interests and/or capabilities would revolve around two fundamental pillars of Japan’s strategy: the role of the US-Japan security alliance and nuclear weapons in Japan’s strategic thinking. Mochizuki (1997: 56–77) places the debate on normalization into three broad camps: Advocates for participation in collective security; advocates for the right to collective self-defense; and advocates for an independent strategy. Ichiro Ozawa, one of Japan’s most influential politicians, and the man widely credited with having engineered the end of LDP rule in 2009, popularized the concept of a “normal” Japan through his book, Blueprint for a New Japan (日本改造計画, Nihon Kaizō Keikaku) in which he articulated his vision for Japan’s participation in a collective security system under the mandate of the UN (Mochizuki 1997: 57–59; also see “Draft Report on Japan’s role in the International Community” by the LDP Special Study Group, headed in 1991 by then LDP Secretary General Ozawa, Japan Echo, 1992 Vol. XIX, No. 2: 49–58). Even though it does not depart from the question of using force, this school of thought has come under attack from those advocating the “right to collective self-defense” because of the trust it puts in international bodies such as the UN. Most Japanese scholars would, however, fall within the “right to collective self-defense” camp. Unlike those who place faith in the UN system to maintain Japanese security, the advocates of collective security place their faith in the US-Japan security alliance. Hughes (2006) argues that Japan’s normalization would be crucial to global security, as Japan’s willingness and ability to support the US would be pivotal in maintaining US hegemony, at least in the Asia-Pacific region. The expected trajectory, however, is that Japan is likely to remain within the US-Japan security alliance for the time to come. Yet, no one should take for granted that the US-Japan relationship is trouble-free or that the alliance provides the best solution to all of Japan’s problems. Green (1995) looks at the question of the US-Japan alliance from the viewpoint of military technology collaboration and highlights the dilemma facing the alliance—the question of strategic “abandonment” by the US versus the “entrapment” by the US into an unwanted military adventure. This vulnerability is especially crucial when it comes to Taiwan or the South China Sea, as one of Japan’s strategic nightmares would be having to choose between the US and China. Therefore, there have been others who have examined Japan’s normalization from a military viewpoint, arguing that the greatest impediment to Japanese normalization is Japan’s inability to safeguard itself from attacks and its over-reliance on the US alliance for its military needs (Green 1995; Samuels 1994). One way forward to remove this impediment is for Japan to comprehensively re-evaluate its own military capabilities and ensure that it is able to meet the challenges to its security either alone or through the framework of the US-Japan security alliance. The more extreme group would of course advocate that Japan build up independent capabilities and even consider the abrogation of the US-Japan alliance (two prominent advocates being the former Tokyo governor Shintaro Ishihara and the late Shoichi Watanabe of Sophia University), and others would advocate that Japan acquire nuclear weapons under specific conditions (Nakanishi 2003). For instance, Nakanishi advocates Japan should acquire nuclear capabilities if (a) US commitment to Japan waivers; (b) China develops blue-water capabilities; or (c) North Korea acquires nuclear weapons. Fortunately, most Japanese analysts’ positions do not fall at either extreme. While neo-realists have a propensity to focus on material interests and power projection capabilities, neo-liberals focus on the role of institutions and regimes in their thinking on the normalization of Japan. One area of critical concern that neo-liberals share with neo-realists is the impact of the Japanese constitution (specifically Article 9, which renounces Japan’s sovereign war-making rights) and the impact this has for the normalization of Japan. Many neo-realist scholars regard the limitations of Article 9 as an abhorrence to be altered or scrapped in order for Japan to have maximum strategic latitude and capabilities. Neo-liberals on the other hand would probably favor a more nuanced approach to the issue of the constitution. As they favor working within, reforming and strengthening existing institutions, they view constitutional and legal reforms as the best way forward. For example, they would consider cutting down the lengthy and protracted legal processes needed to secure support for the dispatch of troops abroad, and they feel that a reconstitution of Japan’s domestic political and legal institutions would be necessary in order for Japan to withstand any political paralysis in the event of a crisis. They might also favor construction of a domestic consensus on how Japan should support the US in the event of crisis within the existing framework of Article 9. A group of scholars under the leadership of Yomiuri Shimbun established the Yomiuri Constitution Study Council in 1992 and actually proposed changes to Japan’s constitution. A new “draft constitution” was published in the spring of 1994 in the Japan Echo. These efforts did not stop and Japan, under the leadership of successive prime ministers from Hashimoto onwards, put forward a series of legislation in order to facilitate Japan having more latitude to send troops abroad. Beyond the reform of the legal and political framework within Japan, neo-liberals might also see Japan’s normalization through economic rather than military means. As long as Japan is able to maintain asymmetrical economic relations with other countries, and engage them through a complex web of economic interdependence, this would endow Japan with the necessary economic clout to be a great power, ceteris paribus. This thinking is not new, and essentially emanates from the Fukuda Doctrine promulgated in the 1970s that saw Japan developing its overseas developmental assistance (ODA) program. While Ozawa cannot be strictly classified as a neo-liberal, his idea of having Japan “normalized” and partaking in UN centered politico-military affairs is an indication of the faith he has in institutions. As a result of left-wing ideology, there is a growing number of people who are working on or researching peace studies, but ironically this includes some who are interested in security studies, which cannot be funded at national universities. Despite this, there is still a number of Japanese scholars writing on security and foreign policy who subscribe to mainstream neo-realism and/or neo-liberalism, and there is a growing interest among scholars working in the field of constructivism concerning these questions. Constructivists are concerned primarily with the “ideational” in international relations—namely concepts such as identity, self-defined roles, norms and values of the nation and their linkages to the foreign and security policies of their countries (See Katzenstein 1996, 1998; Sato and Hirata 2008, for examples). For constructivists, the greatest impediment to the “normalization” of Japan lies not in the material interests or inadequate capabilities of Japan but rather the security culture and self-prescribed foreign policy roles that Japan has adopted since its defeat in the Second World War. While scholars in Japan might not use constructivist language or “terms” per se (in fact many of these scholars write in neo-realist language), many of them do conceptualize and debate Japan’s role in global affairs. Inoguchi (2008), for example, put forward discussions involving Japan’s role in global affairs. In the 2004 article, he debates whether Japan should emulate Britain, Germany or France, and contextualizes Japan’s linkages with the US in such a way that differs from the world role Japan has adopted since 1945. In another discussion, Inoguchi argues that Japan has readjusted and redefined its world role roughly every 15 years, and makes the case that since 2005, Japan has redefined itself as a “Global Ordinary Power” and readjusted its foreign policy accordingly. Soeya Yoshihide, a much respected Japanese scholar, has also argued that Japan must chart itself as a middle power and engage in neighborly policy as Japan’s top foreign policy priority (Soeya 2008). Yet, there are others (Shiina 1991; Okazaki & Sato 1991; Ishizuka 2006) who perceive that Japan should take stock of the changes in the international system and act decisively to participate more confidently in world affairs, including among other things fulfilling its global responsibilities in the Persian Gulf in order to shape its future in the global community (Shiina 1991). Some scholars have argued that Japan is no longer an “abnormal” power in their foreign policy, as observed in Southeast Asia (Lam 2011: 93–209) while others argue that perhaps there are limits to what Japan can do, as in the case of Japan-Korea relations (Swenson-Wright 2011: 146–193). There is every evidence that Japanese policy in the post-Cold War world has begun to move beyond the reactive diplomacy of the Cold War years, and this is especially so in the Middle East (Rynhold 2002). At a policy level, the “normalization” of Japan is thus not a recent phenomenon, but rather has been a political wish, if not actual projects, of almost all the postwar prime ministers. All of them have tried in their way to adjust, modify or interpret their policies in accordance with the latitude given to them to make the best use of the circumstances and the institutions they have inherited to maximize Japanese interests. The question of rejuvenation is to a large extent the result of a new phase of Japanese foreign policy. This in turn is a direct result of a new sense of mission and state power, beginning with Tanaka’s normalization with China and the implementation of the Fukuda Doctrine in 1978 that saw the emergence of a more capable and confident Japan. Japan’s success in its modernization project, the end of the Cold War and the inherent challenges that came with the era spurred on this rejuvenation trend. This book argues that it is vital to understand that efforts to rejuvenate Japan to normality run parallel with a desire for Japan to rise as a great power. Today, the processes of normalization and rejuvenation have come to define the agenda of the neo-conservatives in Japan. This agenda, however, has been interpreted by some commentators, particularly in Japan’s neighboring countries, as little beyond raw remilitarization. There are also questions raised concerning the quality of democracy in Japan. First, critics argue that Japan ultimately has been a one-party state for most of its postwar history, notwithstanding two brief periods—under the Socialist led government (1993–1994) and the Democratic Party (DPJ) years (2010–2012). Second, liberal democracy is imposed, and Japan has not actually bled (in fought wars) for democracy. Third, Japan has always resisted “exporting” liberal democracy as its foreign policy goal, despite US governmental pressure. Fourth, there are competing ideas that detract the Japanese from their liberal democratic credentials: neo-conservatism certainly erodes Japan’s liberal credentials, and grassroots nationalism erodes Japan’s democratic credentials. In short, the ruling party LDP is not all that democratic in its statecraft, and much of Japan’s democratization impetus appears to be emanating from the ground up. Japan’s strategy for rejuvenation, however, has entailed contradictory elements and results: as it seeks greater domestic support for a normalization agenda by reinterpreting its past, its security environment deteriorates because its neighbors in turn interpret this to be a sign of unrepentant remilitarism; as it seeks a greater role in international and global affairs, it piggy-backs on the US-Japan alliance as a strategy, resulting in greater dependence on the US. The Abe administration has purportedly wanted to build an arc of freedom and prosperity, ostensibly to contain China, a country identified as an authoritarian regime, yet Japan is keen to work with Myanmar, Laos, Cambodia, Vietnam and Russia—countries which are also known to have repressive regimes with human rights violations. In order for Japan to protect its cherished democracy, the LDP continually repressed the popular sentiments in Okinawa (McCormack and Norimatsu 2012), legislates security laws and eradicates the peace clause (Article 9) in the constitution to protect the very freedoms Japan says it cherishes. This same democratic resilience would also help balance the tendencies for Japan to take an extreme position in its foreign policy. Recent developments in Japan-US relations since the ascendance of President Trump have deepened a realization that it is essential for Japan to increase interactions with its neighbors—particularly China and North Korea—in order to insure long-term Japanese strategic interests. The rejuvenation of Japan thus becomes increasingly a major challenge simply because restoring normal attributes of a nation-state and achieving the kind of excellence that Japan aspires to is extremely difficult, not only because of the internal debates and contradictions between different Japanese elites and the people, but also because this is taking place in the shadow of the hegemonic competition that is being played out in the Asia-Pacific today, between the US and China. Japan is at risk of being perpetually locked into a subservient relationship, despite its strategy of tightly “embracing” the US to gain more latitude, and being chain-ganged into a conflict it does not want to be involved in. This is particularly so in its management of its relationship with China. Even though Prime Minister Abe has time and again articulated that Japan’s foreign policy is not just about China, but rather that Japan’s outlook should really be global in nature, the very fact that this is articulated often suggests China still remains a significant factor in Japan’s strategic calculations. Repetition speaks for itself. This theme will be further developed in Chaps. 2 and 3. This phenomenon is likely to see two important trends as Japan searches for a way forward. The first is an increased tightening of the US-Japan alliance, thereby increasing Japan’s dependence on the US in all aspects, even though it seeks greater “independence.” This however is against the respect of Japan’s early leaders; from Yoshida to Kishi to Nakasone, most of these leaders were obsessed with the international status that stems from greater international contribution, as well as independence from the US. Also, this process would almost guarantee the accentuation of US-China competition and Japan-China tensions as Japan seeks to do its “part” in achieving alliance goals. The second trend is that this reaffirms the narrative of the China threat within Japan, thus preventing the prospect of Japan being able to work sustainably with China in any manner. This is most manifested today in East and Southeast Asia. That the South China Sea has been militarized is probably one of the most important and frightening episodes of US-China hegemonic competition. At first glance, this might seem a good idea. It would at the very least prevent the possibility of the US and China working out a partnership of sorts that might relegate Japan to a secondary position vis-à-vis the US. This is particularly so, as some commentators have suggested, because China is a more natural partner to the US in resolving of many of the global problems (White 2013). This is not because China is better than Japan, but rather because many of the pressing problems of our time originate from or involve China: Diseases, intellectual property thefts, transnational crimes, food safety problems, counterfeiting industries. This sort of rhetoric, however, is often misinterpreted and/or rejected by Japan—for this is unthinkable. Beyond that, such intense focus on China as a threat is self-perpetuating and self-fulfilling. For a longer term, the benefits of an extremely tight embrace with the US might not necessary outweigh the benefits. The US could undertake policy changes that leave Japan surprised and in a bind. This is not beyond the realm of impossibility. Trump’s about-turn on the Trans-Pacific Partnership (TPP) and his conduct of unconventional diplomacy with North Korea without consulting with Japan are the clearest indications of the fallacy of Japan’s assumption yet. Taking an explicit position out of loyalty to the alliance at all costs, including sacrificing the possibility of engaging and working with Japan’s closest neighbors, is of an extremely high cost. Japan should reconsider and rebalance its priorities to ensure its own interests are always taken care of first and foremost. Today, even though this strategy makes sense to the LDP’s leaders, the question of whether this is truly the case is actually a moot point—simply because none of the leaders who have actually considered viable alternatives have put their vision in place. A Japanese colleague and good friend Sugita Yoneyuki argued that political and military cooperation with China might be possible the day China catches up or even overtakes the US as the regional hegemon. There is no guarantee of course that such a day will come, but at the same time, the assumption that closer Sino-Japan relations can be had at will, particularly after the tensions over the years, is problematic. Beyond that, treating China as an enemy from the get-go will often effectuate this materiality. However, this attests to the model put forth in this book that Japan would always seek cooperation with the strongest power to hedge against systemic challengers and disruptors. If Japan seeks normalcy and rejuvenation, a possible strategy might be for it to consider working on a parallel track with China—maintaining good relations with the US need not come about at the expense of Japan’s relations with China. This could be a viable political choice. Instead of demonstrating “alliance” credentials vis-à-vis China, Japanese politicians could seek an alternate track of working with China outside of the Asia-Pacific region without being detrimental to its existing relations with the US. There are geographical regions and issue areas that China might have more influence over than the US (such as North Korea), and recent developments in Japanese foreign policy might retard rather than enhance Japanese interests. It would help Japan gain greater credibility and shake off its international image as just a US ally. Particularly if Japan wants to play a greater role, and to that extent a possible leadership role in some fields, Japan would need the support of its Asian neighbors in both US-led camps and the non-alliance group. Until Japan receives this support (from both the US-led camp and those outside of this camp), it will have a hard time achieving its aspirations. Its close association with the US might work well in East Asia, but this comes at a cost, particularly as Japan seeks to broaden its role abroad beyond the Asia-Pacific. The association with the US might cause friction for Japan’s policy goals in certain geographical areas and with certain countries, and limit greater goals that it could achieve that might be commensurate with its status in the region. Japan therefore needs to exhibit some resolve that it cares for its Asian neighbors’ security as much as it does for the alliance. Even to this day, there is still certain tension in Japan-South Korea relations, and one might question if these relations can actually function normally without friction without the US. Their relationship, characterized as a ‘quasi-alliance,” suggests the vital mediating role of the US is marred by historical friction and varying degrees of understanding of mutual support (Cha 2000). During Koizumi’s era, it would almost certainly appear that while the US was engrossed in fighting the War on Terror, China and Japan could not handle their bilateral relations independently as Sino-Japanese relations deteriorated to a new low. While one might attribute the deterioration of this relationship to the negligence of the Bush administration, there is a sense that this might be intentional. By the end of the tempestuous period, not only did Japan resolve to tighten its alliance relationship with the US, but Beijing also wanted the same, as it felt that only the US could handle the politicians in Tokyo, and that Sino-Japanese relations could be better managed through Washington D.C. This is not to say that Japan’s foreign policy agenda had not advanced during Prime Minister Koizumi’s term. Koizumi had not only begun to centralize the Prime Minister’s office over both foreign policy and domestic politics (Shinoda 2007), but had also managed to send a clear message to China that historical issues would be factored into Japan’s foreign policy decisions. From China’s and South Korea’s perspectives, there is certainly room for their relations with Japan to be improved. From Tokyo’s perspective, the Koreans and the Chinese have been unreasonable, particularly in not recognizing the gestures and development aid that Japan has provided in the postwar era. Those contributions toward national development ought to count against the demerits of the Second World War. A normal and rejuvenated Japan, therefore, should not continue to bear the cross of war responsibility in perpetuity. This “emotional” stalemate is what inhibits Japan’s closer relations with its neighbors. Japanese politicians, therefore, have always found it easy to exploit these sentiments—as they are deeply felt across the nation, and ingrained in grassroots nationalism in Japan. Yet, the hardest thing for any politician to do is the opposite—to rally the nation not only to have excellent relations with the US, but also with its closest neighbors. A Japan which aspires to regional and global leadership would have the support of not only its allies, but also of its closest neighbors in its own backyard. The normalcy and rejuvenation Japan seeks should not be confined to narrow definitions of military revival. Japan is already an economic superpower with tremendous soft power. Japan is extremely popular in the West, and perceives itself to be a member of the First World bloc. Japan’s normalcy and rejuvenation should come about from a genuine re-evaluation of its priorities vis-à-vis the US and China, possibly rising above the US-China hegemonic struggle to become a genuine global power that is commensurate with its existing status. The democracy movement today is more important than ever to prevent the radicalization of Japanese politics in the widest sense. Ironically many Japanese youths, particularly those of school-going age, are determined to ensure that the LDP and the Abe administration do not completely eradicate the pacifism and democratic culture of yesteryear. Their concern, however, is more about the preservation of democracy and how the government is strong-arming their political agenda through Japanese parliament without seeking a compromise. These youths have been criticized as misunderstanding the geopolitical dimensions of Abe’s strategy. At the same time, popular opinion of China is at an all-time low. Anyone mentioning the possibility of closer Japan-China relations in Tokyo would be politely dismissed at best, at worst laughed at or risk being ridiculed as a “China” or “Korean” sympathizer most of the time. However, this sentiment is not new—nationalism in China, Japan and Korea has all but inoculated the respective nations against any suggestions of working with their neighbors as being unpatriotic and/or foolish. In Japan’s case, the protestors resisting the government attempt to “normalize” Japan are doing so because of democratic inclinations—most feel that the government has ignored public opinion regarding the use of force and deployment overseas. There is less discussion of the revisionist version of history that the Abe administration articulates. The Japanese nation’s instinct to protect the constitution is a major statement against revisionism. There is no stronger apology than to maintain the constitution, and that accepting that the Japanese constitution, particularly the Article 9 “No War Clause” is the most formal apology that the Japanese nation can make to its neighbors. Japan therefore has every reason to let the constitution stand as is, rather than amend it. Japan has done well to adjust to security challenges so far, particularly through minute administrative and legal measures to subvert the constitutional constraints. Japan’s security problems must be dealt with, and certainly Japan needs to take measures to ensure certain parities with China, but constitutional revisionism need not make Japan more secure—in fact, it might make Japan less secure in time to come, should the external security environment deteriorates as a result of this. Chapter 2 examines the historical roots of Japan’s idea of resurgence and rejuvenation, and locates its quest for normalization within Japan’s philosophical and political thinking from ancient times. This chapter puts forth the argument that it would not be possible to understand the nuances and undertone of Japan’s foreign policy today without historicizing Japan’s relation with China and the West. This chapter provides a philosophical and historical context toward the understanding of how Japan has always striven to remain a nation-state par excellence in the tempestuous international relations of the region. The chapter illustrates the contradictory values of egalitarianism and the quest for excellence that is embedded in Japanese political philosophy and social thinking, and argues that since the late fifteenth century, the principal country Japan has always been concerned about in its strategic thinking is China, despite statements to the contrary. The chapter outlines the adapting strategy Japan has used in its historical international relations, particularly through its cultivation of the dominant hegemon of the day, its adaptive learning and its consummate quest for exceptionalism. Shifting its analysis to a more contemporary focus, the chapter examines the rise of the idea of “abnormal” Japan against the traditional philosophical political thinking of the Japanese elites. The chapter then maps out the central tenets of Japanese postwar conservatism before scrutinizing the major differences of the neo-conservatism that drives Japan’s normalization and rejuvenation today. The chapter then seeks to unpack the three major tenets that Japan’s neo-conservatives are concerned with: (1) revising the constitution; (2) managing the US-Japan alliance and (3) eroding the pervasive pacifism that is found in Japanese society. The chapter concludes by examining the ironical linkage on how Japanese democracy and historical revisionism may co-exist, and on how neo-conservatism today drives the paradoxes in Japanese politics and society. In presenting these narratives and discussions, this chapter unpacks some of the contradictory tendencies we see in today’s Japan. This chapter argues that the “irrationality” and paradoxes we see in Japanese foreign policy today in fact conform to the long-term pattern in Japan’s external behavior historically. Chapter 3 examines the tensions Japan faces in its Asia-Pacific policy, and overall raises the question whether Japan’s security is best served by over(t)ly relying on the US-Japan alliance while making a perpetual enemy out of China and North Korea. The principal target of Japanese “normalization” and rejuvenation of its foreign policy is China. Prior to 1998, China had never explicitly been cited as a threat to Japan. Yet as Chinese power grew, the People’s Republic became the primary rationale and motivation for Tokyo elites to drive the rejuvenation of their country. Despite this, in official narratives before 1998, Japanese neo-conservatives only highlighted the dangers of a belligerent North Korea to justify their platforms and policies. As Prime Minister Junichiro Koizumi’s chief cabinet secretary, Shinzo Abe was one of the first politicians to highlight and emphasize the North Korean threat. Their real concern, however, was not so much North Korea, but China. However, by the early 2000s, both North Korea and China have come to play a crucial and important role in Japan’s strategic imagination and narratives. Thus, the period saw Japan doubling down on its alliance with the US, effectively orientating all efforts to harmonize its foreign and security with the US. 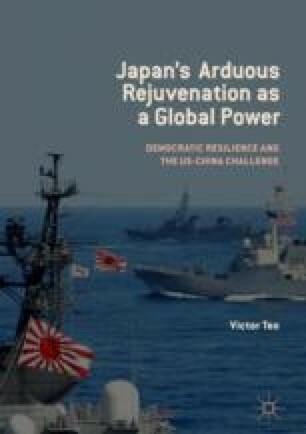 This chapter explores whether Japan’s normalization efforts have paid off in terms of ensuring a more stable outlook for Japan’s security in view of tensions with China and North Korea in recent times, and argues that the greatest security problem for Japan stems from an overt belief in the sanctity of the US-Japan alliance. There have been critical junctures at which Japanese expectations as an ally have not been met (e.g. the US rapprochement with China in 1972 and recently in 2018 with North Korea). Japan’s normalization and rejuvenation therefore currently hinges on the strengthening of the US-Japan security alliance, the revision of the constitution, and the socializing of the Japanese people to reframe their historical perspective and social norms away from pacifism to support Japan’s military reorientation. Prime Minister Shinzo Abe has been moderately successful in strengthening and deepening Japan’s ties with the US, and has been extremely adept at advocating for Japan’s rejuvenation as a global power by persuading the Japanese people to support his agenda of ensuring that Japan lives up to its global responsibility, alliance commitment and democratic spirit at home. Yet, Japan’s plan for this rejuvenation faces serious challenge at home from different political factions and societal groups. Tokyo faces resistance and inertia from the nation’s pacifist traditions and democratic culture that prevents the revision of the constitution or the sustained support of Japan Self-Defense Forces (JSDF) deployments abroad. Externally, Japan risks falling into the trap of being chain-ganged right into the center of a hegemonic struggle between the US and China. There is a big difference between being a good ally and getting entrapped in a position where one’s foreign policy posture is severely curtailed. Japan’s rejuvenation must be built on utilizing US-Japan relations to further its interests in the Asia-Pacific and beyond. In doing this, Japan’s security cannot be worse off than before, because that simply defeats the purpose of the exercise of having an alliance. Likewise, Sino-Japanese relations must be advanced to the point where Japan can leverage and benefit from this relationship for economic growth and security rather than becoming a permanent security liability. Thus leaning to one side at all costs might be politically expedient in the short term, but ultimately self-defeating and detrimental to Japan’s interests in the long run. This is exemplified in the contestation between the US and China in the South China Sea. For Japan to achieve the status commensurate with its economic power, which it has been seeking arguably since the 1970s, it needs the support of its neighbors in both East and Southeast Asia. While some Southeast Asian countries welcome the presence of a stronger US-Japan alliance in the region to balance Chinese influence, competition between the US (with Japan) and China would cause consternation for ASEAN, as none of the countries would want to choose sides. Japan’s rejuvenation should therefore transcend this “with us or with them” divide. Furthermore, Japan’s attempt to revise its constitution may appear to be a normal course of action to the neo-conservatives, but it does hurt its image with its Asian neighbors. As political scientist Chalmers Johnson notes, the peace constitution is the sincerest apology that Japan can make to its Asian neighbors, any amendment to this constitution would have tremendous implications for Japan’s soft power and image abroad, particularly in Asia. Japan’s rejuvenation as a global power cannot come without substantial support from its own neighborhood. If Japan is able to secure this, then prospects for its regional and global leadership would be substantially enhanced. Chapter 4 discusses Japan’s involvement in peacekeeping activities in the Middle East. Even though the rejuvenation of Japan calls for a greater role for Japan in international affairs, the extent to which it is able to do this in the Middle East is still relatively constrained. Over the last two decades, Tokyo’s principal concern with the Middle East is the extent to which Japan can support the US in the Gulf. Japan’s focus seems to be on the traditional dimensions of “peacekeeping,” with its efforts concentrated on traditional elements of military support and humanitarian intervention efforts. This is closely tied to the normalization agenda of having the Japanese military extend its operating range and scope from the Japanese shore, and at the same time enhancing interoperability with the US forces in the region. Such a focus facilitates the incremental erosion of the limits of Japan’s constitutional constraints, as there is great public support for Japan contributing significantly to world affairs and strengthening its alliance with the US. Such single-minded focus, however, appears to stymie the realization of a potential role that Japan could be well equipped to play. The limited vision has not gone unnoticed in Japan, as it raises the question as to why Japan is unable or unwilling to play a greater role in the mediation of the Arab-Israeli conflict, as Japan’s national interests are closely tied to the Middle East. Throughout the postwar period, Japan’s interests in the Middle East have been largely protected by the US, given Japan’s fidelity to the Yoshida Doctrine. In an age where Japan seeks normalization and rejuvenation, particularly after the Cold War, there is no question that Japan’s interests in the Middle East might not necessarily be aligned with the US anymore. This chapter explores and assesses Japan’s past and recent efforts, particularly since Prime Minister Abe came to power, to become a dominant political power in its own right as a peacemaker. The chapter suggests that Japan should consider building a coalition with China and other powers such as the EU to play a moderating influence in the Middle East process, particularly during the Trump administration where the US has zealously leaned toward Israel. In doing so, it might require Japan to rise above its own preference to privilege US goals, and work together with other actors in the international community toward peace between the Arabs and Israelis. The chapter raises questions as to whether the alliance is indeed an asset to Japan’s aspirations to greater political role in areas outside the Asia-Pacific. The book argues that if Japan is able to adopt a more independent strategic stance away from the US orbit, it would be able to find greater traction politically and diplomatically in the Middle East, as the image of Japan held by the people in the Middle East is one where it is capable of playing a greater role in international affairs and being a possible reasonable counter-voice to the US. Any such “normalization” efforts, such as Japanese activities in support of UN sponsored (or otherwise) peacekeeping, peacebuilding and reconciliation in the Palestine-Israeli issue, might be resisted not by China or the Middle Eastern states, but rather by the US. However, this is only possible if Japan privileges US goals to its own interests, and Japan may find that the country that poses the greatest impediment to its rejuvenation could very well be itself. Chapter 5 examines Japan’s deployment to the Gulf of Aden to fight pirates. Compared with Japan’s cautious and incremental approach to other Middle East policy issues, the anti-piracy deployment is one of the most obvious and high profile deployments of the Japanese military to date. The nature of the mission—to protect Japanese and international assets and join an international US-led coalition with a clearly defined mandate to fight a non-state threat—has provided the Japanese government with a strong justification to deploy troops. This chapter illustrates how the anti-piracy deployment has been positive as a whole for Japan’s rejuvenation as a global power. Additionally, this chapter also illustrates that it is entirely possible for China and Japan to collaborate on security matters if there is no political intervention or competitive elements involved. Tokyo could consider working more closely with Beijing on other security projects beyond the Asia-Pacific (such as in the area of provision of international public good), to foster more goodwill and confidence in their mutual bilateral relations. Beyond that, Japan might find that having Beijing roped in on projects where both countries have common concerns would be beneficial for two reasons. First, Beijing has sway in some areas that the US does not (e.g. Iran) and might be more helpful than the US in getting traction in important issue areas. Second, closer Japan-China cooperation might help moderate the vagaries of international politics and the excesses of US unilateralism. This would pave the way for Japan to rehabilitate and become the true and respected global political power that it so richly deserves to be. Chapter 6 consolidates the arguments put forth in the book. The book argues that the US-Japan security alliance both facilitates and hinders Japanese normalization and rejuvenation in different ways. With the Asia-Pacific region, the alliance provides both strategic and tactical advantage for Japan’s normalization vis-à-vis its principal strategic rival in the region, China. Japan’s tight embrace of the US-Japan alliance stems not only from competing interests, clashing identities and nationalism, but also from deep insecurities. This insecurity stems not only from the threat that China poses (whether existential, ontological or material), but also from how the rise of China might affect Japan’s standing in the world and in the region, and most importantly the implications this has for the US-Japan alliance. In short, Japan has a security paranoia that it would be “abandoned” by the US, as the latter seeks to build a new regional architecture with China. Most, if not all, Japanese cannot live with the fact that some other country rather than Japan would play a more important, instrumental role as the alliance partner to the most powerful country in the world. This is in line with the historical model presented in Chap. 2. Yet outside of the Asia-Pacific, it is questionable whether Japan needs to be so reliant on the US. In some issue areas, Japan’s interests are not consistent with those of the US. If the neo-conservatives in Japan are so keen to elevate Japan’s status and rejuvenate Japan as a great power, then surely it would be in Tokyo’s interests to chart a different course in accordance with Japan’s national interests rather than those of the US. From Iran to North Korea, from the Persian Gulf to Africa, Japan could actually reconsider whether cooperation with China (as opposed to the US) in these third countries or issue areas might bring greater traction to the achievement of Japanese interests. True rejuvenation brings forth a latitude of freedom, and if anything this should confer upon Tokyo a new way of interpreting events and geopolitical realities. Working hand-in-hand with China on issues such as the provision of international public goods or co-investment in third countries could bring a reduction in tensions, and more constructive bilateral relations. It might even achieve a win-win solution, not only for Tokyo and Beijing but also for Washington, as Japan could further tighten the US-Japan alliance for the foreseeable future as it seeks to improve its relations with China. In that respect, Japan might achieve greater political status commensurate with its economic power, and find that its strategic choices are not as polemic as it assumes them to be. A “beautiful Japan” could well be a reality in the near future.